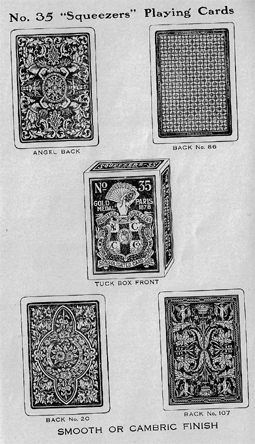 The illustration above is taken from Hoyle's Rules for Card Games, specifically, the 1928 edition published by the New York Consolidated Card Co., Long Island City, N.Y. This is a 2-page advertisement from the back of the book, depicting Harts No. 352 Squeezers Playing Cards. The cards were available with an Angel Back, as well as Back Nos. 20, 58, 86, 95, 107, and 108. Back No. 58 is probably the most well-known Squeezer Back, with the depiction of two dogs and the quote: "There is a tie that binds us to our homes." Those cards are now known as Bulldog Squeezers, and remain available in the 21st century, proving that good designs (or at least interesting ones) do last. 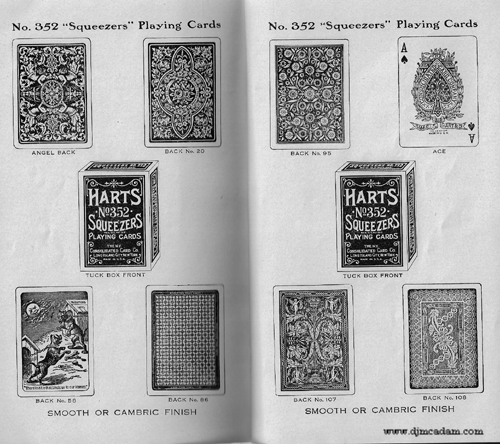 The term "Squeezers" was also used on Bee Pinochle cards manufactured by the New York Consolidated Card Co., on Triton playing cards, and on Second Quality Angel Back Playing Cards. The New York Consolidated Card Co. also manufactured No. 35 Squeezers Playing Cards, which states on the box, "Gold Medal Paris 1878." These cards were also available with an Angel Back, as well as with Back Nos. 86, 20, and 107.